You tell me. The British Airways member of staff at Heathrow who felt the need to ask a line of weary, and by then furious, passengers this, beat a retreat after asking. So perhaps she never found out the length of string. What we wanted to know – although it wasn’t actually me who asked – was how long we’d be there for. She couldn’t very well know this, but her reply might have been more tactfully phrased. ‘Did you see how the lights in the corridor came on as we walked along?’ asked the excited Resident IT Consultant. By the time we walked this particular hotel corridor belonging to Sofitel, I was past noticing anything, least of all the illuminations. Here is a travel moan especially for Candy Gourlay, who claims to like this kind of thing, and for Hilary McKay and her darling, darling Rose,* who – almost – kept me sane, when I had nothing to eat on our British Airways flight other than a Virgin Trains mini-portion of dried cranberries. I could have had the Ratburger. No, my apologies. It was the dead bird, wrapped. Again. The Ratburger* was the book by David Walliams, so delightfully read by small child in the immigration queue at midnight. It warmed a Bookwitch’s heart to witness this. Not that I’ve read the book, but any reading under traumatic circumstances is good. He (she?) ought to have been in bed. That went for me too. My body-clock was an hour ahead and I’d gone without a meal for too many hours. If you don’t count the train-related berries. Sometimes it’s a good thing I squirrel small items away in my bag. The fact that I had walked round Gothenburg airport staring at the cinnamon buns and bananas for sale should have told my inner witch that I’d be regretting not buying them, very, very soon. And I did. Terminal 5’s holding area for the seriously delayed is entirely food free. I suggest they put in a vending machine if they are ‘entertaining’ quite that many irate travellers on a regular basis. It might almost repay what they have to fork out to put people up for the night. Once we actually got to Sofitel of the corridor-lighting cheme, I had very few bad comments left to make, having run out of both steam and a reason why. But I suppose I’d like to have received advance warning that the corridor-light nerds mentioned earlier would also sneak around in the middle of the night, turning off the bathroom light if you don’t wave your arms enough. Or whatever the weary traveller is meant to do to stay all lit up and happy. Other than that, the hotel was pretty good. Glad I wasn’t the one paying. So, back to BA. They are usually pretty good, too. Hence me turning my back on the cinnamon bun. I was certain they’d feed me adequately. And if they ran out of everything, as they did, I had expected the usual BA good manners, and maybe even some initiative, finding me a bread roll from ‘first class’ or something. What I got were two crew members who firmly believe chicken is practically vegetarian. And then we had me, who stupidly believed that once we got to Heathrow, having missed our onward connection – despite being misinformed by the chicken fans on board that we should leg it, and we’d be successful – I’d be sorted soon-ish, and I’d come face-to-face with some food. The queue moved one metre in the first hour. Staff left for the day as we stood there. Fellow (hah!) delayed passengers queue jumped merrily until the annoyed father of two small children told the last one to try it to go to the back where he belonged. String-woman could have been gainfully employed doing some queue order-keeping, and not left it to the tired and worn out. Her colleagues worked hard, but why it should take staff, who presumably do this every night, quite so long for each passenger, I can’t work out. Maybe the Resident IT Consultant could offer his services to improve the software they use. Eventually – two hours later – we emerged carrying two new boarding cards for the day after, one hotel voucher, two emergency overnight packs and two M&S vouchers to make up for the hotel not serving dinner after midnight. I say emerged. What I meant was we then joined the Border Control queue, the UK and EU light version, which lasted a mere 25 minutes. But at least the child in front had The Ratburger. Mercifully this migraine trigger fasting failed to give me one. Must have been the train cranberries. Small, but good. We repaired to our Sofitel room, gobbled down a half past midnight M&S dinner and fell into bed for all of five hours. Now that the queue is merely an unhappy memory, I mostly object to being kept in the dark. In the bathroom. With no warning. (Although if the free wifi had materialised, I wouldn’t exactly have objected.) Consistent and truthful information from BA would have come in handy, too. On the final approach to Bookwitch Towers, the Resident IT Consultant walked ahead, to open the door and shove five weeks’ worth of books** out of the way. Which is why he wasn’t picked up by Little Flower’s grandparents and given a lift the last 300 metres. Little Flower’s Granny then proceeded to offer us some emergency milk at about the same time we discovered Next Door Neighbour has been mowing the grass in our absence. So that was good. Very good. So was the fact that we survived the 25 minute taxi ride before the point where I didn’t buy a cinnamon bun. My last personal best was 30 minutes from School Friend’s house to airport. But a texting maniac who drives well past the legal speed limit can probably arrive before they left, if they really try. * Reading is good for you. Especially when under stress. In queues. That kind of thing. **Might tell you about this some other time. Right now all but Candy are snoring from sheer boredom. Sorry. She knows what she’s doing, that Helen Grant. In The Sea Change & Other Stories (seven altogether) she does that scary thing we’ve got used to from her novels, only in more concentrated form, making everything scarier still. I brought her story collection on holiday as a special treat – for me – and also so I could read a story every now and then, diluting the horror by pausing between stories. Hah! That didn’t work. Not only didn’t the stories feel any less frightening, but they were so good there was no way I was going to pause at all. They are quite traditional in many ways. They could have been written many years ago, by one of the old masters. As it is, they have been written more recently, by one of the new masters. What struck me, apart from being so well written, was how much Helen knows about what she’s writing about. Or seems to know. I couldn’t write a diving story to save my life, and in The Sea Change we get all the – seemingly correct – jargon to do with diving. Remember; don’t dive near any suspicious looking old wrecks. That one was creepy. Wet. Oozing. Before it there was Grauer Hans, where Helen has returned to traditional old German horror tales. That’s very, very creepy. In fact, you want to take care where and when you finish that story. 17th century France, modern Slovakia, Scottish climbing, really weird holidays; it’s all there. It’s all scary. Always interesting, always good writing. 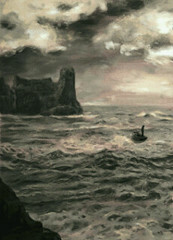 The Sea Change & Other Stories is a most exclusive collection, limited to 400 copies. Hurry, get yours now. I’ve half forgotten about The Move. But I was reminded of a previous move when perusing my holiday morning paper. It was the move from Sweden to England, and it was done very much on a budget. The new Resident IT Consultant gave me all his money, and I promptly left the country. Went shopping at IKEA (this was B.I. – before IKEA – in the UK), and even if I say so myself, I spent his money wisely. Then there was the question of how to shift the stuff across the North Sea. Mother-of-witch called upon her colleague, my former deputy headmaster; a very capable and energetic man. Mr Z had cycled to Sweden from his native Hungary in 1956, so IKEA wardrobes to England didn’t pose much of a problem for him. We used his VW van, and loaded it up with all the flatpacks. This made the van very heavy, and we held our collective breath all the way to Brighton, but the van survived. Or its feathers did. Only joking; I meant the suspension. Mr Z will not be called upon to move again, although he has continued to be kind and very useful on many occasions, including charming GP Cousin to go on holiday through his holiday company. But I was reminded of the unassuming boy on the beer crate a week or two ago. His baby brother is now press secretary to the Foreign Minister Carl Bildt. I belive it’s the result of a ‘can do’ attitude that not all people possess. But sitting on beer crates and recycling other people’s cast-off cars and furniture make for good citizens. And I know that some people believe immigrants only come for what they can get. 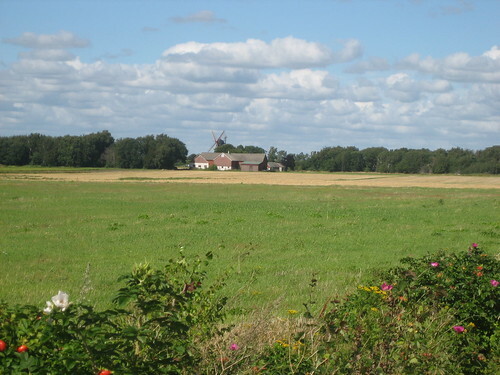 But so many work very hard, and sometimes their journey starts with a cycle ride through Europe. I found the perfect book blog holiday illustration the other day, but was unable to act on it. I was sauntering along the water’s edge, giving my toes some much needed sea contact. It was peaceful strolling, despite the beach being pretty busy. A young girl (early teens?) did the same, but in the opposite direction. She was dressed for the beach, skimpy bikini and all. And she was reading a book. I’m not sure I could walk and read without falling over. I was dying to ask her what book, if she liked it, and if I could take a picture of her for my blog, but it didn’t feel quite decent, even for Sweden. Other close encounters on the beach include a sizeable crocodile. Daughter scornfully pointed out it wasn’t real. But it moved! I swear it did. It might have been inflated plastic, but it definitely moved. So did the little dog which came all the way into the house, as far as my wardrobe office. I heard the pitter patter of feet and turned round, expecting the orange cat (although why it should pitter patter I don’t know, seeing as silent sneaking is more its style), only to find the small beige dog from next door. The giraffe on the café table at the windmill was more sedate. It was leaning against a flowerpot, and didn’t do much at all. We went for ice cream at Margit’s. In fact, it was Daughter’s treat. We must be getting old when Offspring pay for our treats out. I people-watched as I ate my pecan and pistachio cone, slowly realising the children at the next table were very pale. This was explained when I heard them speak English (as well as Swedish, so rather like ourselves). They were clearly so freshly arrived from England that no colour had had time to happen. ‘Real’ Swedish children look like gingerbread children, with straw on top. Speaking of straw, we picked our own strawberries a couple of times. They are no longer covered by straw, but unromantic black plastic. The taste is fantastic, though. Beats the sad mush shops here have started offering their customers. 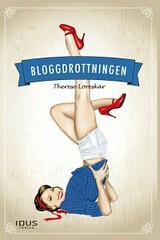 And speaking of half-English children, the local shops have been selling a blogger book. 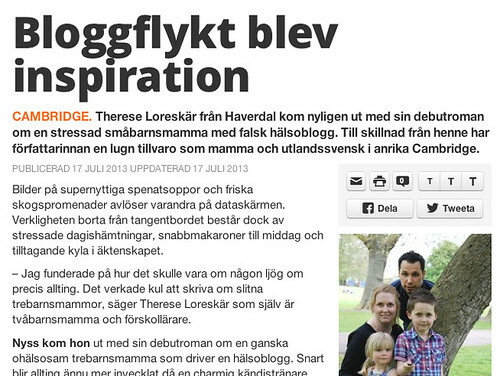 At first I didn’t know what it was; whether a novel written by a blogger, or a book consisting of blog posts. After reading an article in the local paper I know it’s both. Sort of. It’s a novel, written by a local Swedish blogger, recently moved to lovely Cambridge (‘where mothers are at home with their children’ so she had nothing better to do but write a book), although I think it’s in blog post format. They can be a pain; babies. And cats. I mean, who’d want them? 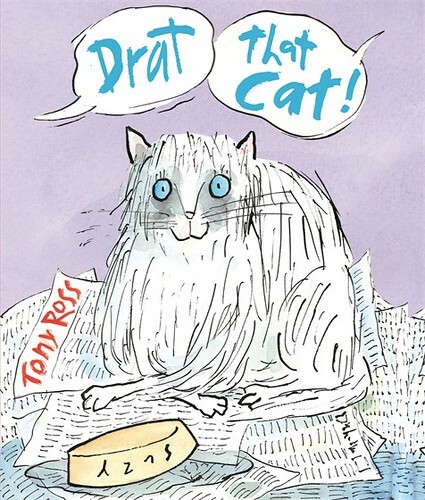 Tony Ross has a new picture book – Drat That Cat! – about a difficult cat. Suzy Cat likes being naughty. She jumps on Granddad and does something unspeakable in Dad’s golf bag. She does things all the time that no one in the family likes. Then she goes off her food and has to go to the cat hospital. The family all miss Suzy. When she returns home they let her get away with almost anything. That’s what Suzy had counted on. Babies are less hairy than cats, but otherwise just about as annoying. 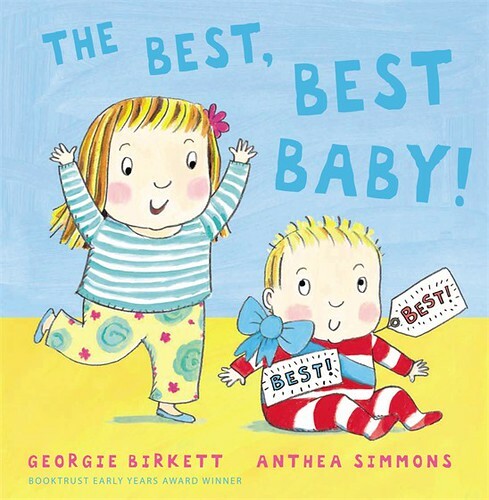 In The Best, Best Baby by Anthea Simmons, with adorable baby illustrations by Georgie Birkett, we see what it’s like to suddenly have a little brother. There’s so much they can’t do! There’s so much they can do, that you’d rather they didn’t. But actually, a baby brother isn’t such a bad thing to have after all. There’s no end to the royal picture books! 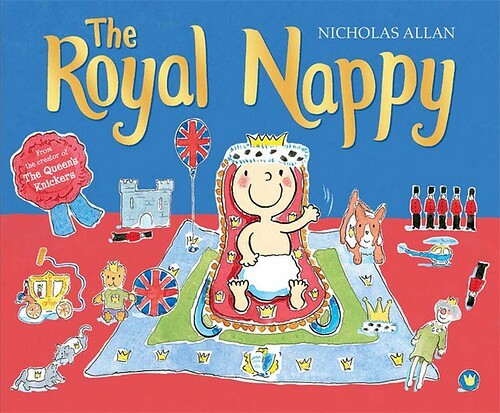 Following on from The Queen’s Knickers Nicholas Allan has taken his interest in royal bottom garments a step further, and we can now read all about The Royal Nappy. Luckily there is a Nanny who keeps track of all nappy related aspects in a royal baby’s life. Helicopters come with a pooey nappy ejector. There are shiny nappies on which a baby can skid the length of the palace floors. And I gather even old Henry VIII wore nappies once. I sense this book might be a hit. Royal nappies feel topical, somehow. 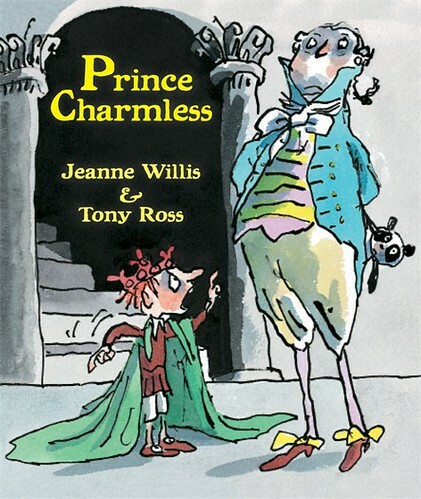 Let’s hope the nappy-wearer will not be like Jeanne Willis’s and Tony Ross’s Prince Charmless. He’s a spoilt little thing. Nothing is ever good enough, despite the palace staff working very hard. So one day everyone leaves and the King and the Queen don’t know what to do, because they have to rule the country. In the end they let the Prince do things for himself. And what do you know? Prince Charmless discovers it’s fun to do things, and by the end he has – almost – turned into a Prince Charming. Plenty of lessons here for all of us who mollycoddle our children. We should all busy ourselves with ruling the country, allowing the children to discover the world. Within reason.